Regina Landor, originally from Ohio, has worked with aid organizations in Romania, Serbia and now Bangladesh, where she co-founded the organization Thrive to bring lunches to children in the slums. 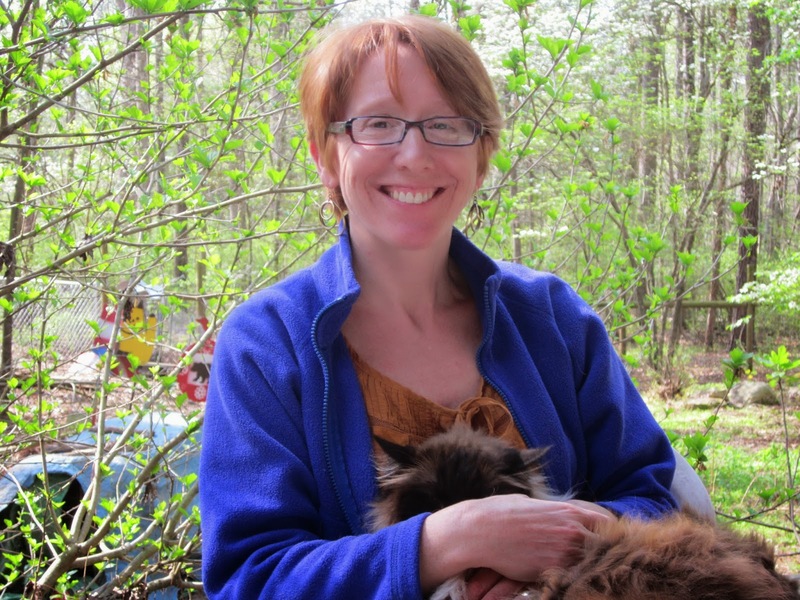 Her story -- and her life devoted to helping others -- is inspiring. 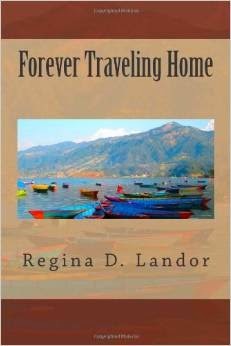 Her book Forever Traveling Home is available from Amazon. IMBO: Regina, welcome to I Must Be Off! Before we talk about your writing, I'm dying to know more about USAID in Bangladesh. What exactly does USAID do there, and how are you involved? Landor: My husband works for USAID. They do development work in food security, health, education, and democracy and governance, including labor issues. IMBO: Without going into too much detail, what does one have to do to work for USAID? Landor: It’s a lengthy process! You need an MA, overseas experience, and a desire to help others. A lot of people who work for USAID have also served in Peace Corps. IMBO: In your last email to me, you mentioned that just getting home in Dhaka can be harrowing. I'm paraphrasing, but is Dhaka really as dangerous as people say? Landor: Bangladesh does not, and cannot, live by the same safety standards that we are used to in the US. As expats, we are incredibly fortunate in being under the protection of the US Embassy because we are very well protected under their care. But there is no guarantee that we will be safe all the time from the traffic, where few laws are adhered to, the construction sites that are all around our neighborhood, and the exposed electrical cords that hang loosely above all the sidewalks. A couple of times we’ve been trapped in the elevator in our apartment when the power has stopped. Even though our building is brand new, the emergency alarm was not functioning. When we reported it to the embassy, they took care of it immediately. 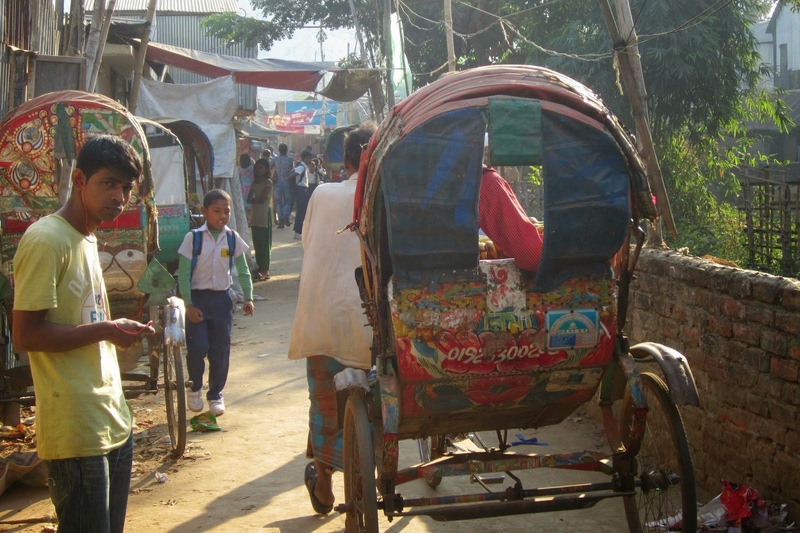 For Bangladeshis, there are very few safety nets to help them when there is a need. Hunger is rampant. People die of diarrhea due to contaminated water. Open sewers line the streets. Sanitation is hard to come by. So yes, it is life on the edge. 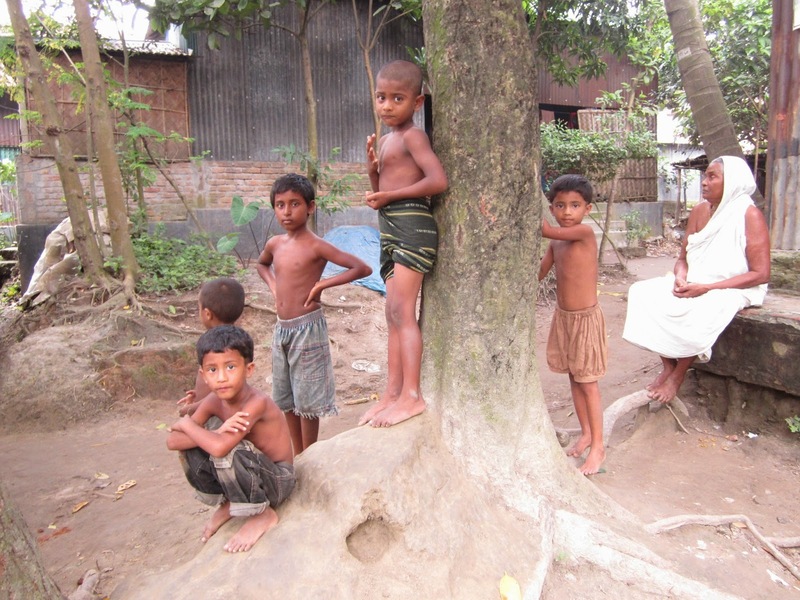 For millions of Bangladeshis, they are living on one dollar a day. The danger for millions of people here, including the thousands of street children, is figuring out how to stay alive and not always knowing where the next bowl of rice will come from. IMBO: Have you noticed improvements since the Rana Plaza disaster? Landor: Minimum wage for garment workers has increased from about $39 a month to about $69 a month. There are more unions now. USAID is helping in that process. These are modest improvements, but obviously more are needed. The disparity between the wealthy and the poor is enormous. The most obvious visible hardships are right in the streets below our apartment windows where beggars stand at the intersections, cycle rickshaw drivers work for about $1 a day, and day laborers do back-breaking work – men and women who sit on the sidewalks hammering bricks into rubble. 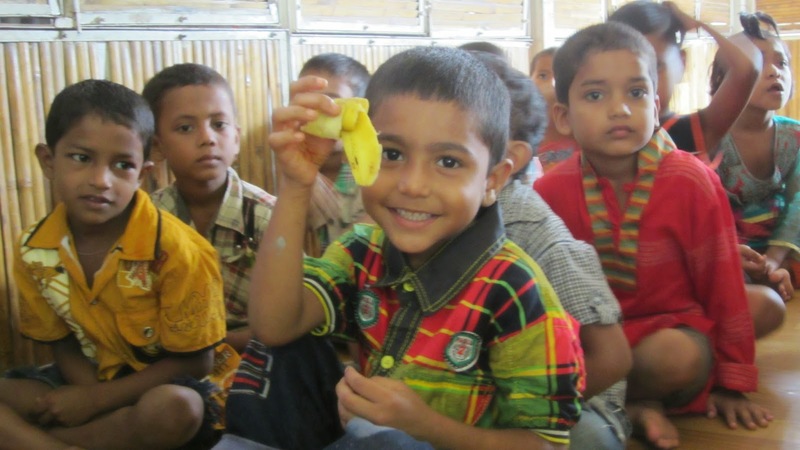 IMBO: You co-founded an organization to bring free lunches to children in the slums of Dhaka. Could you tell us more about Thrive? Landor: I would love to. 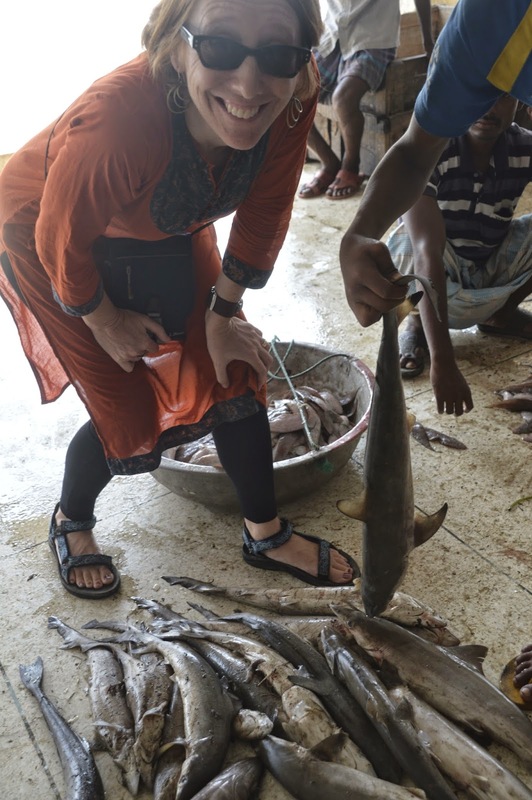 Two other moms, like me, arrived in Dhaka around the same time and we simply did not want to just ignore the hungry street children that we see every day. We learned of a school in a slum very near our own neighborhood that had 250 kids and that fed them a snack one day a week. We decided that the least we could do was bring them bananas so that they'd begin their day with something healthy in their bellies. We started to bring other healthy snacks -- carrots, oranges, peanuts, boiled eggs -- so that they would have something to eat every day. We posted pictures on Facebook, and without asking for donations, people started to give money. We decided that with our funds, we could expand. Our volunteer list grew, and with the help of expat and Bangladeshi volunteers, we now bring food to five schools in the Dhaka slums. We also started a hand-washing program at the schools because diseases spread quickly and people die here due to a lack of clean hands. If you'd like to see some pictures of beautiful kids eating healthy food and scrubbing their hands, here is the link to our Facebook page. IMBO: Let's talk about your writing. You’ve published a book, Forever Traveling Home. What’s it about? Landor: I wrote it during our first posting overseas, in Belgrade, Serbia. I wanted to capture the distinct difference between being a Peace Corps Volunteer and being the spouse of a diplomat. My husband and I met while serving in the Peace Corps, in Romania, so going back to Eastern Europe felt a bit like coming home, but not quite. Also, this time we had toddlers in tow! I give a bit of background, too, of why I joined the Peace Corps in the first place, after leaving my first husband, of landing in Macedonia and then being evacuated, and of that ultimately turning into a good thing – it’s because of the evacuation that I ended up meeting my husband in Romania. I move to the present and describe my feelings about being back in Eastern Europe and what a bit of a shock it is. It’s lonely at first and I cannot find a place for myself, and I have a much broader sense of responsibility with my children. I fight through the fears and the loneliness, question where home is, find humour in small things, and decide that if this is our life – of moving every few years in the Foreign Service – then we have no choice but to make the most of it and that home is wherever we happen to be. IMBO: Wow. What a fascinating – and quite difficult – journey. I can’t wait to read it. I love that premise: moving home, finding home, and finding home within yourself. Where is your home originally, and what have you kept – tangibly or intangibly – from that place? Landor: Such a good question! Because we do say goodbye to places, but it’s true that we always keep something with us forever from places we’ve lived. I grew up in Berea, Ohio. We moved there when I was five and I left at 18. I’ve held on to an old Teddy bear (tangible) and even though I’m 49 years old, I still kind of like seeing him around. The intangible would have to be the love my father, who is no longer living, gave me. He believed in me, and my creativity, and supported me throughout the ups and downs. He was a writer and I think he also believed in me as a writer. Wherever I lived I wrote letters home and he cherished those letters and the details they contained. He taught me about the simplicity of language: keep it simple. I try to do that in my writing, and still evoke emotion. IMBO: What other expat authors could you recommend to the readers of I Must Be Off! Landor: In the November issue of The American Foreign Service Journal there’s a list of expat writers who have published books this past year, including a short description of the books. Here’s the link. I also have friends in Dhaka who are writers and would love a chance to also share their story. I will let them know about IMBO! IMBO: That would be great. Thank you, Regina! And thank you for sharing your story with us. I’m sending you tons of respect for the work you do. And I’m wishing you success with your book, Forever Traveling Home (Amazon link to be added). Landor: It was my pleasure! Thanks for listening. Great to see you on here, Regina! From pool to slum to blog...what a life we lead! I'm impressed and thank you so much for what you do. When someone cares the world will change. I love reading all of the good things you are doing over there, Regina! I am thoroughly impressed. I really love what you are doing withing the schools and providing food. Good for you! Thanks for sharing this!